The active ingredients included in the shampoo promote active regeneration of cells of the scalp and hair. Mink oil is rich in unsaturated fatty acids, it perfectly tones up the hair, restores the natural protective sheath of hair, improves its structure and returns the positive integer-HYDRATED and healthy glow. Arnica has anti-inflammatory, disinfectant, healing properties, enhances blood circulation. It helps to restore the lost strength of hair. D - has healing properties and stimulates the regeneration of tissues. Soap root - a natural, more gentle foundation for washing hair, not found in conventional shampoos. Dermatologic shampoo is recommended for dry and brittle hair. 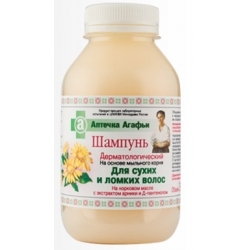 product has passed laboratory tests in TSNIKVI Ministry of Health of Russia.